Tencent’s discount to Facebook is getting harder to justify. The Chinese social media giant brought in roughly the same amount of revenue as its U.S. counterpart last year and was more profitable. Yet it trades at a lower multiple of earnings. The valuation gap warrants a rethink. In China, where Facebook, Twitter, and YouTube are banned, Tencent dominates the country’s social media networks. The Hong Kong-listed company boasts over 1.4 billion monthly active users on its Facebook-like QQ and QZone platforms. Its popular chat app WeChat, which combines messaging, games and payments, now has 500 million users each month. Though many users probably have multiple accounts, they generated $12.7 billion in revenue for Tencent last year, slightly more than Facebook’s $12.5 billion. The similarities between the two end here. While advertising accounted for 92 percent of Facebook’s revenue, gaming is Tencent’s primary source of income. Games like League of Legends and Candy Crush Saga generated 57 percent of the company’s revenue. Membership fees from QQ and Qzone brought in an additional $3 billion. The Chinese group’s 30 percent net margin is also healthier than Facebook’s 23 percent. As a result, Tencent’s earnings last year were a third higher than at Mark Zuckerberg’s company. Yet investors place a lower value on the Chinese group’s earnings. Its shares trade at 33 times forecast net profit for the next twelve months, according Eikon. Facebook shares are on 39 times. Concerns about future growth may help to explain the gap: Tencent may find it hard to expand far beyond China’s borders. By contrast, just 15 percent of Facebook’s monthly active users are in North America. That may explain why its earnings are expected to grow faster in the future. Even so, the difference may be harder to justify as the two business models converge. Facebook announced on March 25 that it would open up its Messenger app to become a platform for other services – similar to WeChat. Meanwhile Tencent is experimenting with advertising on its chat app, which Barclays estimates could generate more than $3 billion in revenue by 2017. Tencent shares have risen by more than 30 percent this year, while Facebook’s are up less than 5 percent. Expect the gap to narrow further. Visitors use their smarts phones underneath the logo of Tencent at the Global Mobile Internet Conference in Beijing May 6, 2014. 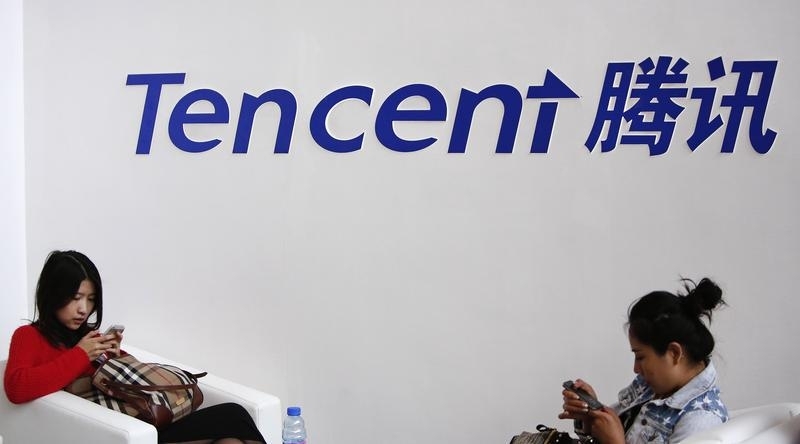 Chinese gaming and social media giant Tencent reported revenue of 79 billion yuan ($12.7 billion) for the year ending December 2014. Earnings increased 54 percent to 23.8 billion yuan. Tencent operates China’s popular messaging and social media app, WeChat, which had 500 million active users at the end of last year. The company also owns QQ and QZone, China’s largest social networks that have 815 million and 654 million monthly active users respectively. U.S. social network Facebook opened up its Messenger service for developers to create apps in an attempt to transform the mobile messaging service into a full-featured platform, the company revealed at its annual developer conference on March 25.